This is just a picture that I photoshoped from the original Chuck Norris Approved stamp. One day I had a sudden realization that Dink Smallwood could lite Chuck Norris on fire in a second with just a pissed off stare. 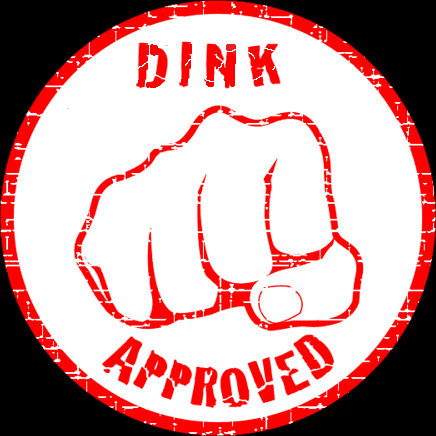 So I just had to create the unoffical approval stamp for the Dink Network. YOU HAVE BEEN DINK APPROVED!! When I first read about this file, I thought it would be some awesome drawn artwork of Dink hi-fiving a shopkeeper after buying a light sword, and giving a thumbs up. I was thoroughly disappointed to learn that it was not awesome, far from it. Instead it is supposed to be some sort of seal that a king might make into a stamp, and stamp royal documents with, or if it were resized, it could be placed on fan sites with a link to a particular website. With a resize and a lot of doctoring it could be made into a program icon. The centre of the "seal of approval" features a fist. The outline is in red, and has some sort of layer effect which makes it sort of look worn out or something. This same effect is also applied to the text which above reads "DINK" and below reads "APPROVED", which are also the same colour of the outline of the fist. There is nothing to signify that it has anything to do with Dink or his right fist, as I could change "DINK" to read "MILDER" or "SAVEBOT" and it would have the same impact on the viewer. Outside the red border, there is a large opaque black section, which means that one would have to convert that section to transparent if they wanted to use it for anything interesting. Considering the file's a PNG it could have been quite easily done by the author, but they either forgot or didn't know how. This large black outline detracts from the main part of the seal of approval and lessens its appeal. Personally, I could have done the same job in about 5 minutes in MS Paint.